﻿I have not yet received a response to the questions below. I will post the response whenever I receive it. I sent you an email some time ago and just in case it didn't arrive with you I am sending it again. The email concludes with a couple of questions. I think your answers to the questions will help resolve the concerns this parent has. As I said below, I will eventually put this communication online to evidence the openness with which we are working together for the benefit of families afflicted by autism. I believe this is the best way to avoid misunderstandings. I have just been talking with a parent who is rather distressed about the reaction of AutismNI to a petition that she wanted them to share with parents. The parent, who is also a member of AutismNI, really can't understand the reluctance to circulate her petition. Though she was offered a personal meeting with you, she felt unable to accept the invitation because you could not permit her to record the discussion for her husband to hear. I am now writing to you on her behalf. As with our previous correspondence I will make this letter public and i will make your response public. I will only release this letter, though, after I have given you time to reflect on the implications of the issues raised below. Firstly, in case you don't know, there are now 37 States in America that have enacted laws that mandate health cover for ABA. Just recently, TRICARE has also updated its policy on ABA coverage for the U.S. military. The parent is confused as to why, when 37 States in America agree that there is sufficient evidence to create laws that make ABA available in Health plans, N. Ireland's autism charity is not proactive in promoting ABA. Even more puzzling to her is the fact that an online training program called Simple Steps, made just about 100 yds from AutismNI headquarters, has received international recognition from the U.S.A. for the way it teaches ABA. In other words, she notes that parents in N Ireland are sharing information on ABA to parents in other countries but AutismNI will not circulate a petition locally that calls for more information to be made available to parents so they can make an informed choice. On this link you will learn about the online program and you will be able to see the presentation that Autism Speaks made in Belfast when nobody from AutismNI was able to attend. The Association for Behavior Analysis International (ABAI) is the primary membership organisation for those interested in the philosophy, science, application, and teaching of behavior analysis. The organisation has affiliate chapters in 42 countries worldwide and within it there are 36 Special Interest Groups including, for example, Autism, Neuroscience, and Behavioral Medicine. The ABAI Executive Council serves as the Board of Directors for the Society for the Advancement of Behavior Analysis (SABA) whose mission is to identify and support projects important to the advancement of behavior analysis. This is a hugely significant accomplishment by the STAMPPP team that will help promote ABA in Europe. At a time when autism is on the increase worldwide, the SimpleSteps program (www.simplestepsautism.com) was designed to provide accurate information on Applied Behaviour Analysis for parents and professionals. Returning to the petition and the help requested from me by the parent, here is a list from her of those who support her petition. ﻿As I see it there are two questions that should help resolve this issue. Firstly, if my understanding of events is correct, can you please explain publicly why you thought it appropriate not to circulate a petition whose sole purpose was to inform parents about ABA. Further to our public discussion, some parents are interested in seeing how you respond to some other questions. I share this interest. As you may know, there is momentum in the USA for bills to be passed that will ensure that ABA is covered by Insurance. I note, though, that at this time there is still nothing on the AutismNI website about ABA, and I note also from looking at assets for AutismNI that there can be no financial reasons for this state of affairs. Can you explain why there doesn't seem to be an urgency for AutismNI to communicate recent developments in the USA about ABA? Because AutismNI has not deemed it necessary to update their site to include coverage of ABA as a matter of urgency, am I to take it that AutismNI would not support a similar call to institute emergency regulations in N. Ireland? In case you don't have time to read the whole story, here is snippet taken from the site. "I am extremely pleased that the Office of Administrative Law has approved our emergency regulations," said Insurance Commissioner Dave Jones [right]. "These emergency regulations will ensure that insurance companies cover medically necessary treatment required by the Mental Health Parity Act and Senator Darrell Steinberg's (2011) autism treatment legislation. Jones proposed the emergency regulations in February by declaring autism a public health crisis. He said denials and delays by health insurers in approving Applied Behavior Analysis (ABA) treatment were making the crisis worse. Given the extent to which AutismNI has been informed of recent developments in ABA, can you tell me whether the forthcoming Celtic Nations Autism Partnership summit in Belfast (http://www.awares.org/pkgs/news/news.asp?showItemID=1162&board=&bbcode=&profileCode=&section=) will have professionals invited who will address the issues involved in rolling out ABA to the community? Given that AutismNI is not the only autism charity in N. Ireland, I have copied these questions to the chairperson of PEAT (www.peatni.org), the ONLY charity in N. Ireland whose mission statement is in line with the urgency identified by California judge mentioned above. I look forward to hearing from you so that the public can see the earnestness with which we work together to help parents and children in our community. First of all, let me congratulate you on your recent honorary award from the University of Ulster (UU). It was well deserved for all your hard work advocating for children and families affected by autism. My reason for writing to you is to solicit your help with respect to the right of children diagnosed with autism to benefit from effective education. All of the points below were discussed in Stormont on 31st July with Mark Mullan, the Special Adviser to the Minister for Education. As you know from numerous communications and meetings with myself and other members of the ABA community and numerous publications in this area, including presentations to the all-party autism committee by myself, Prof. Dillenburger from QUB, and Dr. Martin from the European Association for Behaviour Analysis, that there are a number of basic issues at the heart of evidence-based practice that are relevant to autism provision in our community. · The Task Group Report is 10 years out of date. 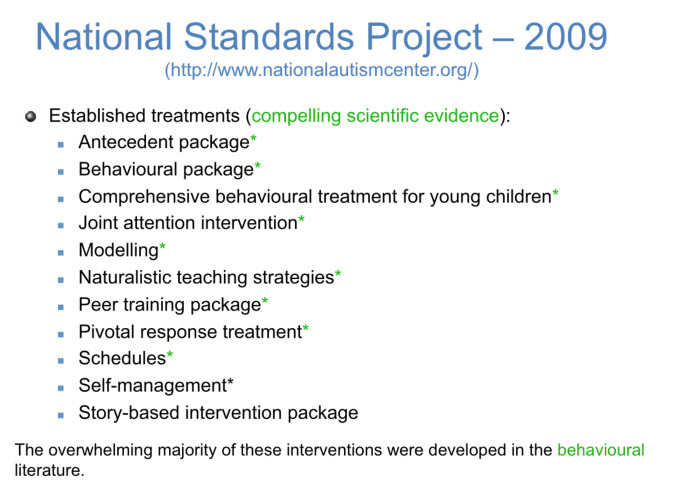 · The Task Group Report contained serious inaccuracies in its depiction of the science of Applied Behaviour Analysis and the evidence for its effectiveness even then (see below). Given that both AutismNI and PEAT regard the life of child to be sacrosanct, and that given that both promote the need for evidence-based practice, the implied suggestion that anyone would promote something that is NOT child-centered is startling to both organisations. As you know, the science of Applied Behaviour Analysis is renowned for its emphasis on the individual (as discussed in my YouTube presentation). You also know that it is ethically reprehensible to willfully mislead politicians by creating the false dichotomy in the statement above between child-centred and method-centred approaches. For example, Medical science is Method-driven in that it uses the Scientific Method. It is also person-centred in its applications and can deal with the unique needs of each individual. Likewise, Applied Behaviour Analysis is guided by the Scientific Method and its emphasis on tailoring interventions that meet the needs of the individual. Politicians do not know this about Applied Behaviour Analysis, as the statement by the Education Minister at the time clearly shows. WASHINGTON, DC (July 26, 2012) -- A federal judge in Washington has handed military families a major victory in their pursuit of insurance coverage for Applied Behavior Analysis (ABA) therapy for their dependents by ruling in a class action lawsuit that the Department of Defense's (DoD) policy of limiting benefits to active duty members was "arbitrary and capricious." I presume you also know from Autism Speaks that 31 States have mandated Insurance companies to pay for ABA because the evidence for its effectiveness of overwhelming (http://www.autismspeaks.org/advocacy/states). 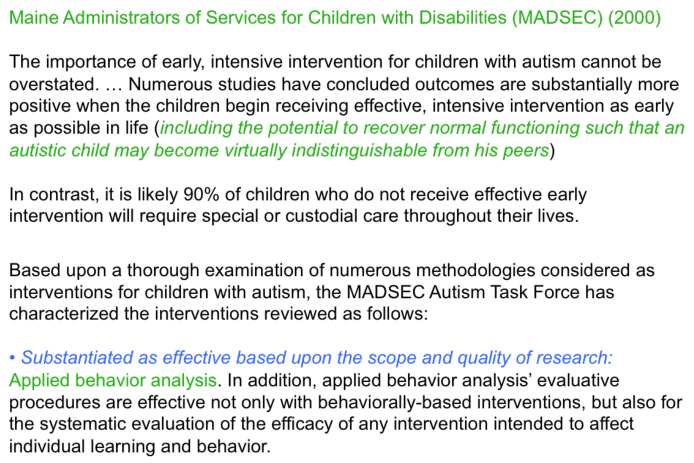 I presume you also know that the U.S. Office of Personnel Management, which manages benefits for federal government employees, has determined Applied Behavior Analysis (ABA) merits insurance coverage for the treatment of autism for federal employees. Their review panel determined that based on ample scientific and empirical evidence, ABA qualifies as a medical treatment, rather than purely educational. This will apply to health plans for federal workers beginning in 2013. I presume you also know that from July 1, 2012 school districts in New York will, by law, have to use only licensed or certified behaviour analysts to provide applied behaviour analysis for students with autism spectrum disorders. You also know from Dr. Martin, despite statements to the contrary by the Dept. of Education, that Educational Psychologists do not receive training in Applied Behaviour Analysis that meets international standards as laid out by the Behaviour Analysis Certification Board (www.bacb.com). By implication, you also are aware of any misleading suggestions by the various Trusts or Boards that they have in place appropriately qualified behaviour analysts. You are also aware of publications outlining the cost-benefit analysis that would allow the NI taxpayer to save £millions in the long run, if services here were based on Applied Behaviour Analysis. This information from Scotland is particularly illuminating in that the desire to correct misinformation about Applied Behaviour Analysis is in sharp contrast to the persistent misinformation about this science in N. Ireland. You also know that the government in New Zealand has also corrected misinformation about Applied Behaviour Analysis, again influenced by the same source that has influenced policy in N. Ireland. You also know that politicians make a serious ‘category error’ when they talk about PECs AND Applied Behaviour Analysis as if they were comparable. PECs is a commercial product that has been developed by professionals trained in the SCIENCE of Applied Behaviour Analysis (i.e., Andy Bondy). I presume you also know that neither the Department of Education nor the Department of Health, Social Services and Public Safety have consulted with professional bodies associated with Applied Behaviour Analysis or with the local Universities who both provide training in ABA (School of Psychology at UU, School of Education at QUB). As a consequence there are no documented discussions of how Applied Behaviour Analysis can be implemented within communities. Given the recently bestowed honour from UU based on your work in the field of ASD, I assume it goes without saying that you are appalled at this state affairs and the disservice to our community. Individuals with ASD in Northern Ireland receive a Cinderella service compared to their international counterparts who have been benefitting from services and interventions based in the science of behaviour analysis for over 40 years now. It is my belief that a powerful way to help parents and children would be in the guise of a unified call from the Voluntary Sector (AutismNI and PEAT) and Higher Education Sector (UU and QUB) asking the DoE and DHSS&PS to acknowledge and address the errors outlined above. Distinguished Community Fellow, University of Ulster. Holder of the Personal Achievement Award from the New York State Association for Behavior Analysis. Thank you very much indeed for your very warm congratulations and kind comments on the Honorary Doctorate from the University of Ulster. understanding and implementation of ABA practices. I want to assure you that I have noted the contents of your attached correspondence and that it will be added to the other pressing issues that have been identified by Autism NI for attention by the NI Executive in relation to Autism. As you are aware, Autism NI has facilitated a number of awareness/lobby opportunities for PEAT and other bodies through our role as Secretariat to the All Party Group on Autism. We will continue to be alert to opportunities to ensure that ABA receives due consideration in whatever forum Autism NI is involved. "I acknowledge the issues that you have raised regarding the understanding and implementation of ABA practices." you mean also that the absence of accurate information on Applied Behaviour Analysis on the AutismNI website will be addressed given the information you now have on ABA? I will be posting my question and your response online again so the public sees how we are working together for their benefit. that as soon as we can. Please accept our apologies for any undue delay. 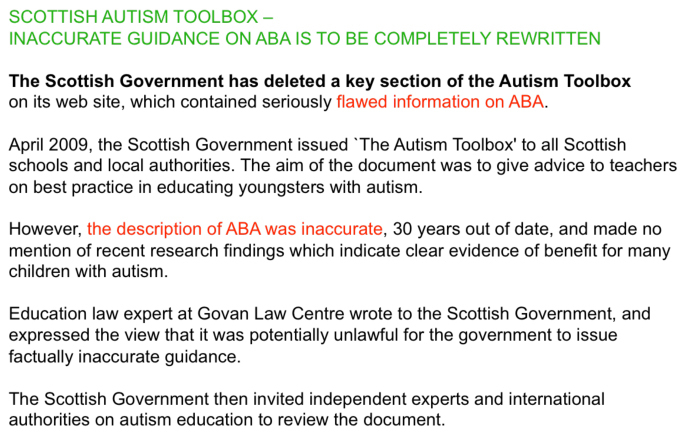 Given that AutismNI has no explicit expertise in ABA, and given that there is so much misinformation about ABA in the community, it might be an idea if you involved ABA professionals in the update to your site. For example, you could consider employing the services of Dr. Neil Martin from the European Association for Behaviour Analysis. If Dr. Martin was unable to help, I would be happy to advise you on other ABA professionals you could approach. I feel it is good for politicians and the public to see the united front from these exchanges between us. When thinking about what else we could do together to help the momentum needed to progress things, I thought you might like to consider a joint ABA conference. I'm sure we could persuade QUB and PEAT to join as well. I will keep your advice and offer in mind. We usually don’t carry a huge amount of information on ABA as we prefer to signpost to those who can give that expert advice. In the meantime it might be fairly easy to add this link to your site for parents. It describes the European funded project to help parents in other countries who also don't have access to ABA professionals. The project involves professionals from 8 countries in total, all of whom are leading professionals in their own countries. My reading of this statement is that it confused ABA (the science) with DTT (one of the many procedures developed from within the science); it seems you also didn’t know that PECS and picture schedules are simply other examples of procedures developed on the basis of the science of behaivour analysis by a colleague of mine, Andy Bondy. In addition, it seems you didn’t know that all ABA-based procedures are based on individualised and ongoing assessments that make them child-centred and holistic. I am also intrigued that you mentioned London-based organisations rather than the leading Belfast-based ABA organization, PEAT, who were founded on my initiative with parents in 1997 and who have been actively delivering ABA-based training and interventions since then. Could you please tell me if and how your position with respect to ABA has changed since your presentation. Regarding the process of bridge building, it would be important for me to know if you have plans to communicate corrections to the Houses of the Oireachtas or to the NI Assembly. I take it from your non-response to my previous mails that you are either not too pleased with my request for you to correct misinformation on ABA, or else you personally are not in a position to make changes without agreement from AutismNI as a whole. In either case, perhaps we can continue on a different level. I suggested at one point that we work together to produce a conference on ABA so that we can correct, together, the misrepresentation that exists towards ABA; misrepresentation that you are now fully briefed in. This is especially important given that calls to correct misrepresentation are often considered aggressive by the establishment that persists in the misrepresentation. Attached is a program outline for a forthcoming conference (Brescia, Italy) in which I shall be outlining the obstacles to the uptake of ABA in Ireland (also available from www.stamppp.com). Since we each agree with the importance of putting parents and their kids first, it would make sense to produce something like this conference in N. Ireland; I could source the ABA speakers. An alternative event would be to organise a debate between Gina Green and Rita Jordan, or someone who in your opinion would present the case against ABA. This could be a way of bringing things to a head so that transparency has a new beginning in N. Ireland. When PEAT was first established, one of its main goals was NOT TO EXIST. It is cruel to expect parents to lobby on behalf of science when they have so much to contend with at home. They are not paid for their work and the last thing they need is to have to fight for science and the rights of their child at the same time. If you know of any parents who could help fund either of the events I outlined above, feel free to let them contact me. I guess you will have to trust me that I care for parents and their children. Perhaps I can show this best by my continued outreach to you and your organisation. I recieved a reply to my letter above but was asked if this could remain private. Attached is a flyer produced by a parent in Dublin. It shows what happens when government bodies refuse to engage with ABA professionals. The parent asked if ABA was a science. This is a straightforward question and one that would have been easy to answer if the professional body in Ireland for behaviour analysis had been approached. However, instead the government approached professionals not trained in behaviour analysis, professionals who may have been involved with Autismni at some point. Note the contrasting views expressed, and the implications are very serious. When ABA is misrepresented like this, then it is no wonder that obstacles to it persist in our community. To emphasise the point, here is an example of how ABA should be portrayed by AutismNI. And then gradually, I began to understand ABA more and more. I started to understand what is was: Not some dehumanizing control of people through a cynical manipulation of rewards and punishments, but rather the light of scientific exploration brought to bear upon behavior, and upon learning. If parents are to be truly empowered with knowledge about basic scientific skills in educating their children then I would urge you again to make it a priority to have the information on your site about ABA updated. If need be, I can make a personal contribution to putting this online communication on your site. The All Party Group on Autism (APGA) hosted an event to celebrate their achievements yesterday. Both the University of Ulster team in the School of Psychology and the Queen's University Autism Research and Treatment (QUART) Forum/Centre for Behaviour Analysis at QUB are concerned with providing support for individuals with ASD and their families, i.e., both run Masters courses to train staff in ASD and have a long history of ASD related research. As secretary for the APGA, can you explain why neither UU nor QUB received and invitation and had to be told about the event by a parent-led charity. I have been instructed that I cannot divulge communications on this issue until permission has been obtained from MLAs in Nov.
You recently agreed that I should forward to the APGA your request to release online the Secretariat's response to your enquiry about the approved invitation process regarding the above event. The matter was discussed at the APGA November meeting and permission was given. This message below was not from me to Arlene, but I thought it important to insert it here. PEAT had written requesting minutes of the two meetings in which I, and Prof. Karola Dillenburger from QUB, and Dr. Neil Martin from the European Association for Behaviour Analysis, each presented the international views on evidence-based practice and early intervention in the treatment of autism. I acknowledge receipt of your letter to the APGA Secretariat dated 19th February 2013, which arrived with me on 6th March having been redirected from Parliament Buildings. I will add your request to the APGA agenda for their next meeting on 12th March 2013 (1pm – 2pm). I hope that a representative from PEAT can attend if you wish to contribute to the meeting.